A hotdog here and a plate of greens there? A well balanced diet benefits individuals of all ages, but aside from eating a little something from each food group, consuming enough key nutrients promotes physical and mental wellbeing. Some vital nutrients are particularly important as a person ages, even though unique medical conditions and lifestyles determine the specific foods that some should and others cannot eat. A review of four diet essentials can be an eye-opener for older adults, who often restrict what they eat for convenience, medical reasons and personal preference. Vitamin D is essential to bone health, muscle strength and muscle function. In addition to combating osteoporosis and protecting the skeletal system, sufficient levels of vitamin D are necessary for organ health. Research also shows that vitamin D protects the cells from cancer. Most are aware of the role calcium plays in bone preservation, so they further make the connection to healthy teeth. Other benefits include safeguarding against kidney stones (the opposite of what many believe is true), regulating blood pressure, preventing certain cancers, preventing cardiovascular disease, balancing pH levels in the body (which, for one thing, puts less stress on the kidneys), aiding the digestive process, enhancing skin health, and regulating hormones for optimal function. While the body can manufacture most kinds of fats it needs from other materials, including various fats, Omega 3s must be ingested from a source. As a result, studies show that deficiencies in Omega 3 fatty acids appear in every age group. Notably, by keeping inflammation in check, Omega 3s are essential in controlling or preventing arthritis, heart disease and cancer. Dehydration is a common problem among older adults. Interestingly, thirst tends to decline with age, but humans continue to need about as much fluid. Certain medications also require additional water to work effectively. Clear, light-colored urine usually indicates that an individual’s water intake is sufficient. Other fluids, such as juices, contain water, but they can also have high levels of sugar. If concerned about filling up on water and diminishing the desire to eat, then curtail drinking before and during mealtime. With so many factors to consider, those who have questions or concerns about diets for seniors should consult a physician and possibly a dietician for personal guidance. Exercise not only makes the body feel good, but various kinds of physical training also enhance balance and agility, core strength and posture, and function and endurance. In addition to building stronger muscles, including the heart, and fortifying bones, working out engages the brain, making the individual more alert and responsive. Importantly, too, those who regularly exercise benefit from a deeper, longer and more restful night of sleep, so they awake feeling more refreshed, better equipped to take on the day, and less inclined to trip up. While many like to follow a simple routine that they enjoy, perhaps taking a daily walk, incorporating various types of conditioning delivers more than one important aspect of fitness. Strength or resistance training, which fortifies muscles and builds bone mass to combat osteoporosis and frailty, is particularly important for older adults. Props include free-weights, exercise machines, and elastic bands, although some who are just starting out should begin with the motions first and later add the weights and bands. Strength training proves most effective when performed two or three times per week on nonconsecutive days. on TV, and in print) offer ways for adults to practice and improve stability at home. One example is to stand, holding onto a stable chair, and raise one leg for one minute. Next, repeat the movement with the other leg. Gradually increase your time of standing on one leg, and strive to do so without holding onto the support. Another goal is to balance with one’s eyes closed. Standing with feet shoulder-width apart and using a chair or counter for balance, count to four as you slowly push onto the balls of your feet. Stay on your toes for two to four seconds. After, return to your heels on a count of four. hold a position that is painful. Of course, make sure that you are medically approved for the exercises you’ve chosen and that you are not at risk of falling or otherwise injuring yourself while alone. Keep in mind, too, that working with a qualified instructor, at least when starting out, provides assurance that you’re using the right weights in the proper stance or entering yoga positions correctly. Professional personal trainers and class instructors further assist in developing routines for optimal benefits. Best of all, exercising with others grants wonderful social benefits—friendship and fun, as well as encouragement and accountability! Please feel free to contact Menders for more information about activities to improve and maintain your mobility, stability, strength and independence. Children are not the only ones who benefit from having pets to love, care for, and enjoy. 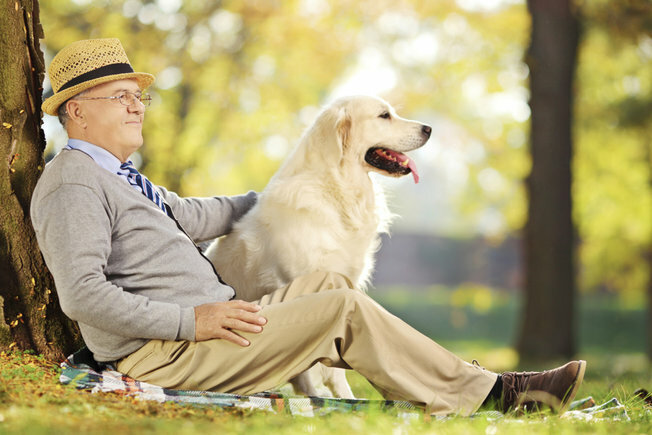 Dogs, cats and other animals have a way of making adults of all ages feel young at heart and remain healthier. When searching for evidence, you’ll likely come across a study of senior owners of pets conducted by the Baker Medical Research Institute in Melbourne, Australia (1992). Spanning three years, the research involved 5,741 individuals (3,394 men and 2,347 women) of different socioeconomic backgrounds with varied personal habits, such as smoking and nonsmoking. All such behaviors were exhibited in the diverse group of pet owners (784 in total), yet they had significantly lower blood pressure, and triglyceride and cholesterol levels for numerous reasons. By spending time with an animal who lives in the moment, pet owners worry less and suffer less from stress. Being with a dog has been shown to reduce cortisol, a stress hormone. Many pet owners confide their worries to their animals, and expressing their concerns to anattentive listener makes them feel better. Animals, particularly barking dogs, not only ward off intruders, but help their owners feel safer at home alone. Animals have a calming effect on Alzheimer’s patients, who often get agitated. From more meaningful and frequent social interaction with fellow humans (getting outmore and sharing common interests with other animal lovers), pet owners are less lonely. Whether partaking in a full workout by throwing balls and walking, or simply petting/brushing fur and keeping arthritic hands moving, people who have pets are more physically active. Better appetites result from feeling happier (interactions with animals increase serotonin levels) and less lonely, as well as from exercising and adhering to mealtime schedules for their animal companions. Their responsibility for another living being minimizes pet owners’ focusing on themselves. Pet owners have a greater sense of purpose when they know an animal companion depends on them. Whether from talking to their animals or keeping track of care requirements, pet owners are more mentally engaged. Pet owners are constantly rewarded by an animal’s unconditional love. Interestingly, the positive effects of pet ownership seem to negate certain lifestyle choices. For instance, pet owners in the Baker study were more active overall, but as a group, they also consumed more alcohol and fast food. Without question, a beloved pet plays an invaluable role in an older adult’s physical and mental wellbeing. Considering how greatly an animal enhances quality of life, seniors and their loved ones should not discount the value of having a best friend at home. The advantages continue if the animal moves with the owner into an assisted living. If that’s not possible, it’s also reassuring for nearby family or friends to take the best friend so he or she remains accessible.